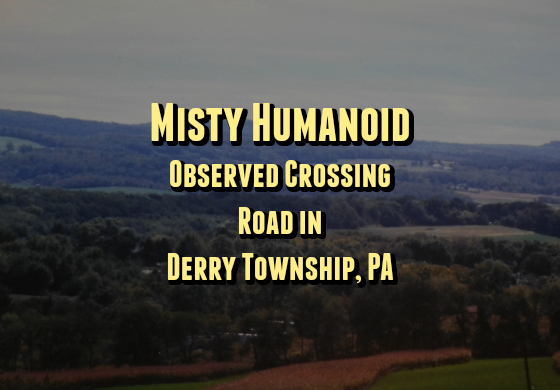 On the evening of September 10, 2018, a man was riding down a rural road in Derry Township in Westmoreland County. It was a rainy night when his headlights caught something about 75 feet ahead of him that seemed to “appear out of nowhere.” Whatever it was, it was in the middle of the road and moving from left to right. The witness said when he first saw this being he first thought it was fog. He soon realized there was no fog in the surrounding area. The witness said it was hard to describe what he saw, and that it was a humanoid form that was foggy or misty in appearance. The man stated that it was a “foggy white form” that was about 6 ½ to 7 feet tall. The creature seemed to be somewhat stooped as it moved. The physical traits that stood out to the witness were the huge muscular shoulders and a small waist. There was a head but he couldn’t see it clearly. The arms and legs were also not clearly discernible. The witness observed the creature from its left side for several seconds. The creature crossed the road and entered into a field where it seemed to just vanish. The man could not see its feet and stated that it moved “almost like it floated.” The witness didn’t notice any smell or sounds during the observation. The incident took place only a short distance from the Chestnut Ridge where there has been a long history of UFOs, Bigfoot, and other cryptid encounters.